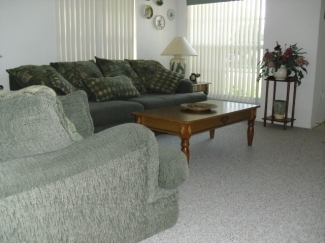 Our very comfortable, well equipped villa is furnished and cared for to a high standard. The very comfortable lounge with large sofa and love seat ,cable digital flat screen TV, Stereo radio/CD player is the perfect place to relax,there are also many books and games for all ages to enjoy. The Dining area with table seating 6 persons and breakfast bar for two adjoining our fully fitted kitchen with all mod cons.including fullsize stove,dishwasher ,microwave and large fridge freezer with ice maker.well stocked with crockery,tablewar and pots and pans. The master bedroom well furnished with Queen size bed,Flat screen TV/DVD,telephone and internet modem.Safe. The En suite bathroom has a large walk in shower and also allows direct access to the pool. House bathroom with bath and shower. 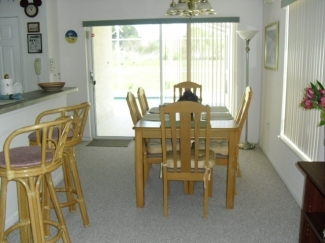 Lovely pool not overlooked at the rear..well furnished with chairs and loungers. 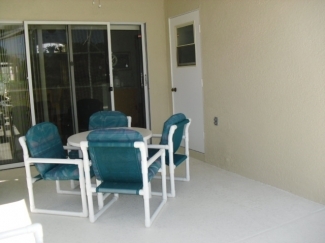 Covered lanai with dining set and overhead light and fan..great for dining out Florida style or that relaxing nightcap after a busy day at the parks! Free WIFI for your laptop. Large garage with automatic door. 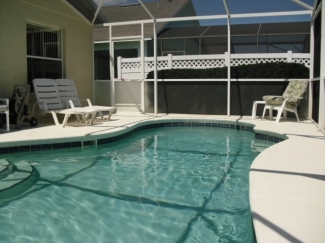 Our DREAM villa is just a GREAT home for a GREAT holiday!